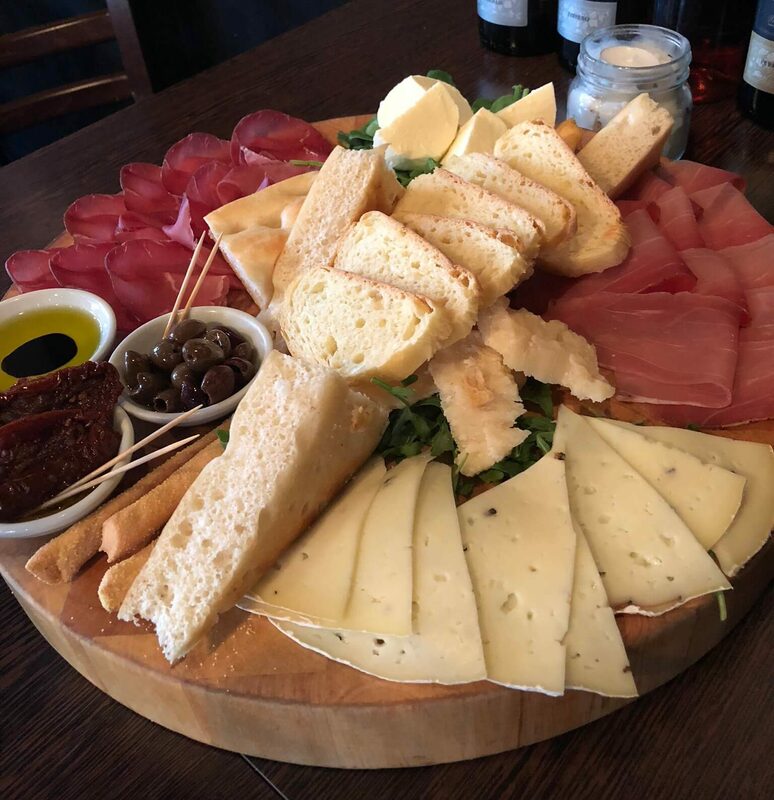 This weeekend we headed into Nottingham to go wine tasting at Veeno, the Italian Wine Cafe. I’ve never actually been wine tasting before (I know, right?!) so I was super excited, although slightly apprehensive as I am a bit of a white zinfandel girl! The atmosphere inside Veeno is just like a wine bar in Italy – it’s kind of dark, there’s lots of wine everywhere and it’s effortlessly stylish. There’s also an outside terrace which is lovely for when the weather’s good and there are patio heaters for when it’s not so warm. 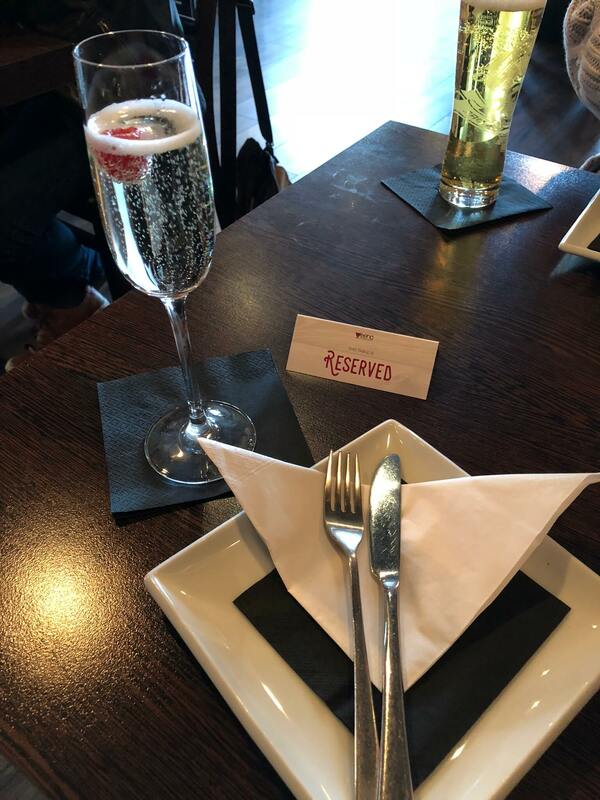 We were greeted by a waiter who was really friendly and were treated to prosecco and Peroni while our platter and our wines were prepared. The platter of meats, cheeses and breads was absolutely huge and way more than enough for two people. 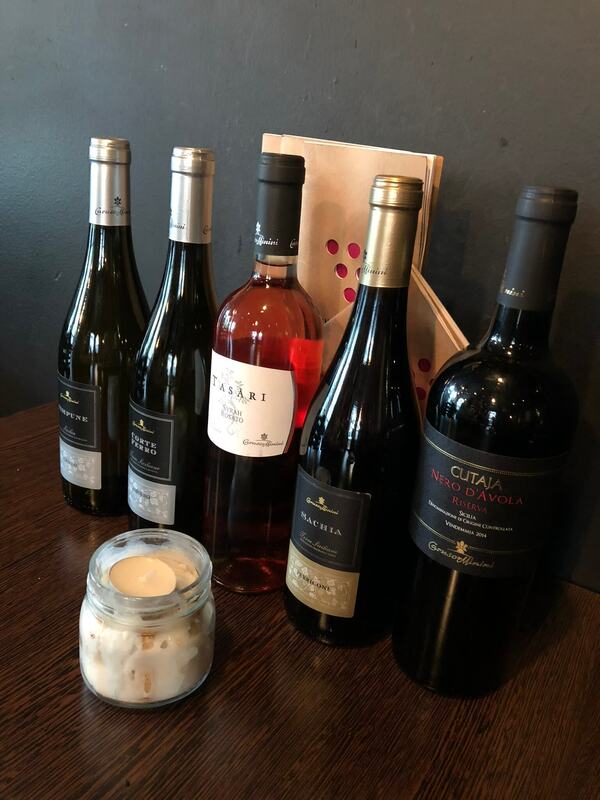 Each wine was matched to a cheese or meat and there were five Sicilian wines to try – a dry white, a sweet white, a dry rose and two red wines. I surprised myself as I’m not usually a fan of red wine but the first one we tasted, a perricone was really nice and something that I might consider ordering in the future. Each wine was matched to a cheese or meat and there was mozzarella, truffle cheese, lemon cured beef and a smoked ham which were all delicious. There was also tiramisu for dessert (classic Italian!) 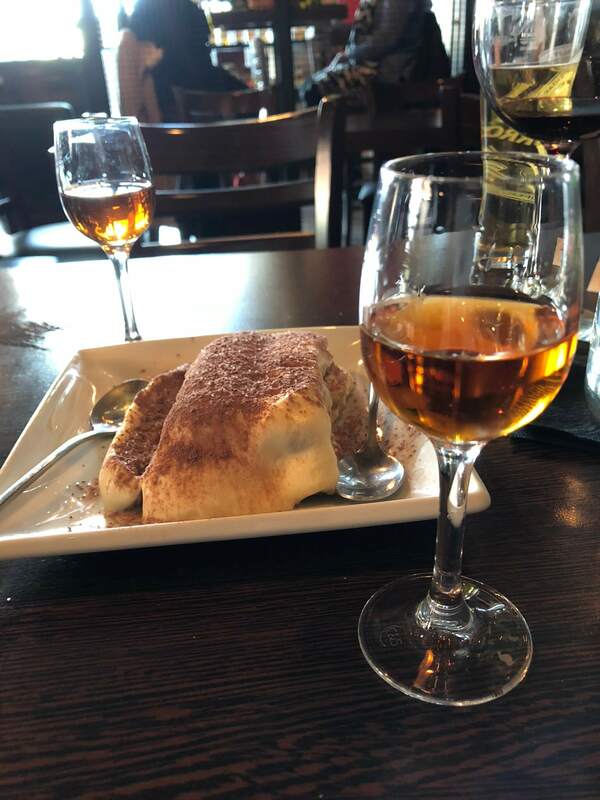 with a dessert wine, which was very much like a sherry and really strong! The waiter knew lots and lots about all the wines and I really enjoyed the educational part of the experience – we learned that heavier bottles are made with reinforced glass and that these usually have the more expensive wines in them, and that the deeper the dent in the bottom of the bottle, the better the wine and the easier it is to pour. It was a lovely way to spend an afternoon and one that I think some of my friends would also really enjoy – the perfect end to a girl’s day out shopping in the city! I’d definitely love to do more wine tasting and I think I’ve got a (ahem) taste for it. My friend has told me about somewhere in Santorini where there are epic views and delicious wine so that’s on my list and we’re looking forward to visiting Domaine Chandon in Melbourne’s Yarra Valley when we visit Australia in February. 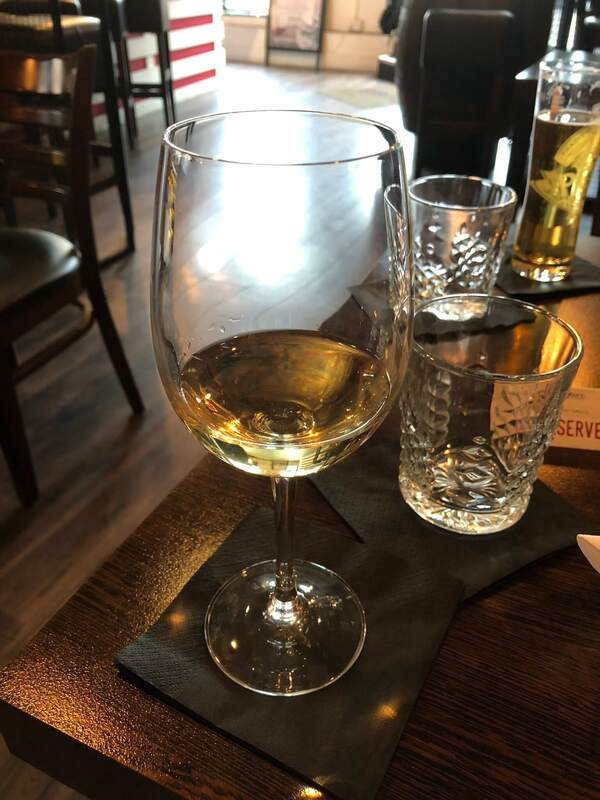 I would recommend Veeno’s wine tasting experience to anyone as it’s a good chance to try some wines that you wouldn’t necessarily order and you might just learn a thing or two as well! Find out more about Veeno and their wine tasting experiences here.